This architecture is an assembly of 3 "bridges", each representing an axis in the three-dimensional space. It serves as a lighthouse and a hostel. It provides private and public spaces that allow walkers to stay and relax, to discover the uniqueness of the surrounding environment, and to interact with the local culture of Laxe. Which program(s) should I choose to combine with the lighthouse? 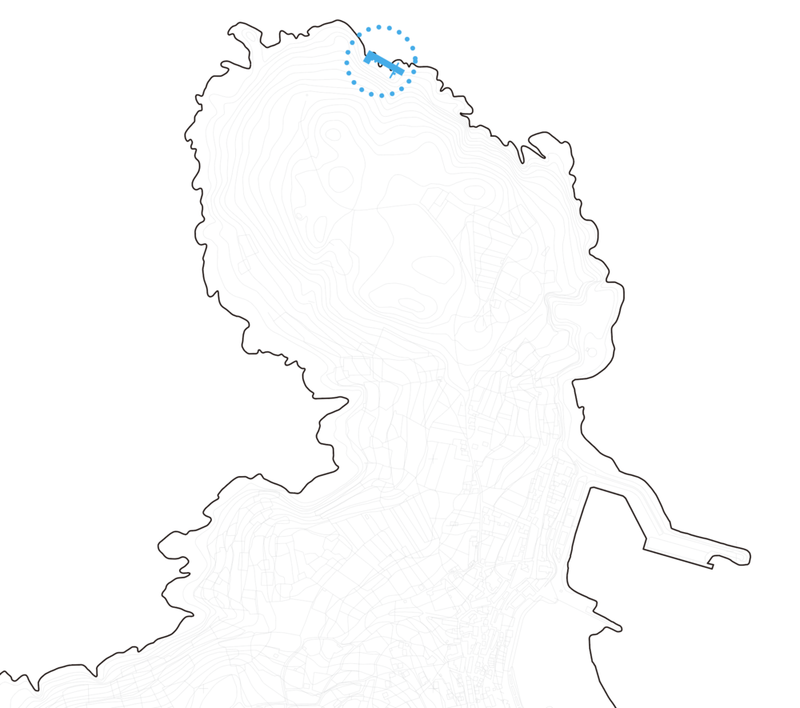 Where should the architecture be sited on the peninsula? What kind of spatial experience do I want inhabitants to have around the architecture? Through research I learned that costal walking is a popular activity in the area due to the popularity of walking on the historical pilgrimage trail network, Camino De Santiago, in Spain. I thus wanted to design a lighthouse + hostel to give walkers a place to rest. I also found that Laxe is a lovely fishing village with fishing boats going and coming throughout the day. I wondered if my architecture can become an interaction point between visitors and local fishermen/percebeiros. A cove is found on the northern tip of the peninsula, which is an ideal place for the planned program. The site conveys the unique geographic qualities of Laxe with its rock-based ground surface and coastal erosive condition.It has a gently sloped periphery, and is well-sheltered from the Atlantic wind. Its nearby ground condition naturally guides visitors to deviate from the main road and walk toward the chosen site. I explored three types of spatial conditions and wanted to incorporate them into the architecture: the "above", the "within", and the "below" conditions. 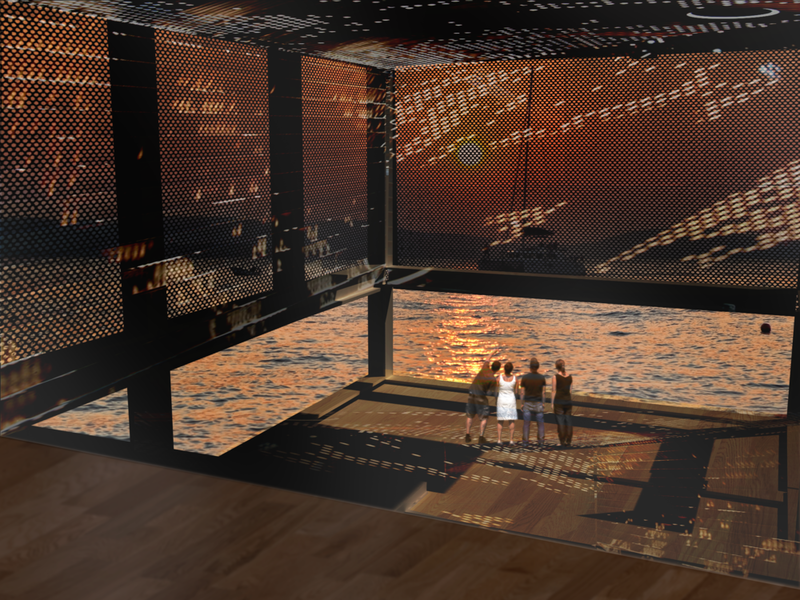 The "above" experience is bright and expansive, and is closer to the sky; the"below" experience is dim and confined, and is closer to the sea; the "within" condition provides a framed view of the horizon, which connects the sky and the sea. These spatial experiences can be created by using architectural elements to interact with the site, and would allow people to observe the natural environment from unique perspectives. Various forms are experimented to integrate with the site, aiming to find an ideal solution that would produce the envisioned three types of spatial experiences. A tower that serves as a fire escape, a viewing platform and a lighthouse. The circulation within these 3 volumes allows visitors to be detached from the land, to float on the sea, and regain their attachment with the ground. The middle section of the bar volume is divided into 2 layers: the upper private residential zone and the lower public cultural zone. Two ends of the bar are designed to be 2-story lounges that connect the residential and cultural zones. The cultural zone is essentially a dock that runs along the long bar and links the two ends. It can be functioned as a fishing market, allowing visitors to interact with local people and gain an insight of Laxe’s fishing culture. The private zone consists of 10 guest rooms with additional attics that could accommodate a total of 30 people. Doors are located along the south side, making the terrace space both a circulation path and a micro social space. Bathrooms and kitchens are located at west end of the bar, where the volume turns its orientation and physically cuts into the hill. The public zone includes a mini port that allow fishermen and guests to be able to enter from the bottom. 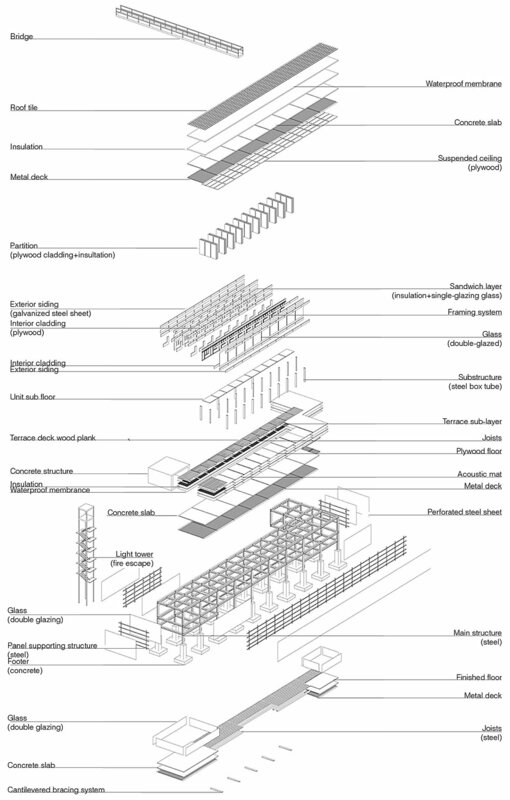 Light steel frame System is chosen as the main supporting structure. Perforated Steel Sheet covers the entire upper level to ensure privacy without losing the spectacular view. The guest room interior is cladded with plywood panels to create an intimate yet dynamic atmosphere. Steel I-beams and metal decks are exposed on the underside of the main bridge, revealing the raw nature of the structure.